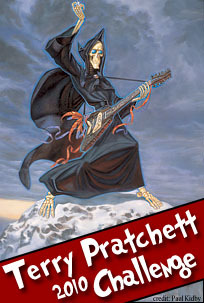 Last week for Sunday Salon, I posted the list of participants in this year's Terry Pratchett Challenge. I thought I would also provide a summary of the reviews that people posted as part of the challenge! Please let me know if you participated in the challenge, or you have written a review and I have missed it. Wow - I JUST saw your challenge (Terry Pratchett). I LOVE Terry Pratchett books. I found them in the mid nineties (I think) and have read all the discworld books. If I had known about this challenge, I would have signed up for it, but with only three weeks of December to go, it would be silly now. Are you planning on hosting this for 2011? Sadly, didn't quite make it into the coven... but I did get to be an academic!